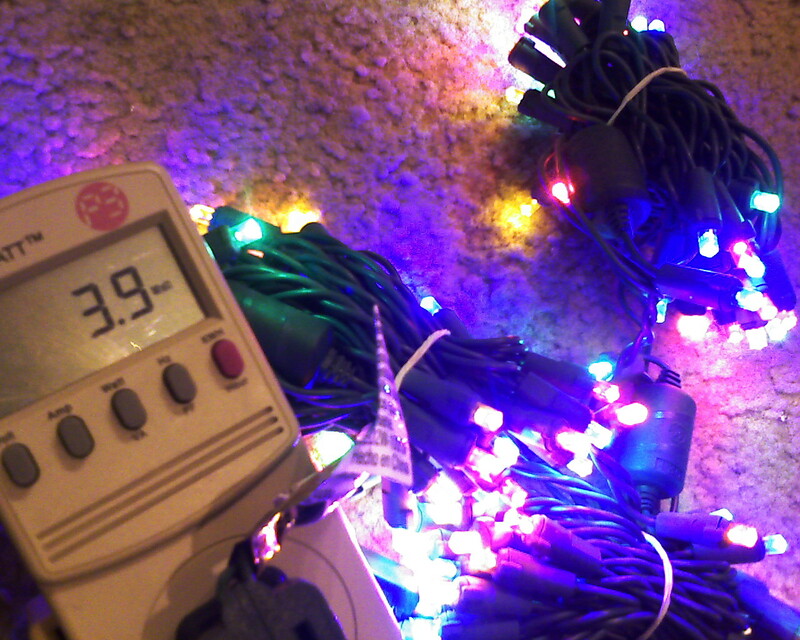 Do Christmas LEDs Pay for Themselves? 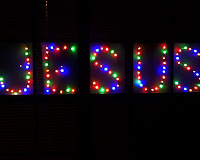 Each year LED Christmas lights become more widely available and better priced. But they're still on the expensive side. Old-style incandescent lights go for under $3 for a 100-light string, while LEDs start at about 4 times as much at $12 per 100. But do they pay for themselves? More precisely, how long does it take, and how much electricity-cost do they save? But the lights are sure to burn out someday, and they consume 21.6 Watts of electricity. What about replacing them with LEDs? Even by doubling the lights to a 100-light LED string, the new string uses only 3.9 Watts of power. Note that the claims of 80% and 90% energy-savings on LED packaging are real, not just hype. 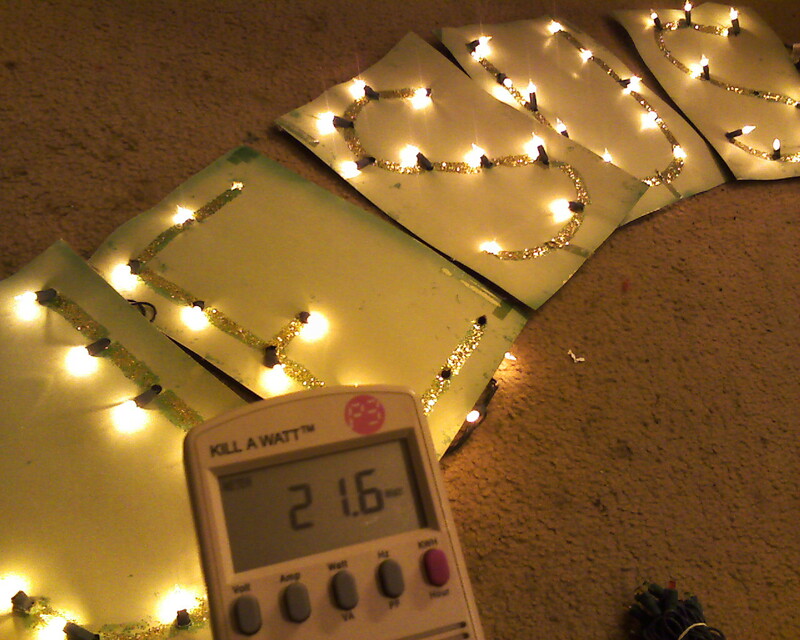 4 Watts of LEDs can replace 44 Watts of incandescents--that's just 9% of the power! So the new string saves 1/2 dollar a year. It will pay for itself in just 24 years! We can celebrate the savings at our 50th wedding anniversary. Well...the change has to be justified on principle and other ancillary grounds, such as, that 100 lights look better than the skimpy 50-light array. Of course, if replacing 100 lights with 100 lights, the savings would more than double to $1.13 per year (= 0.62 x 2 - 0.11), so the payback period would be cut back to just 11 years. For a new string, the payback time is based on the cost difference between incandescent and LED strings. For a 100 light comparison, the price difference is $9, while the energy savings is about $1.13 per year, so the payback is about 8 years. 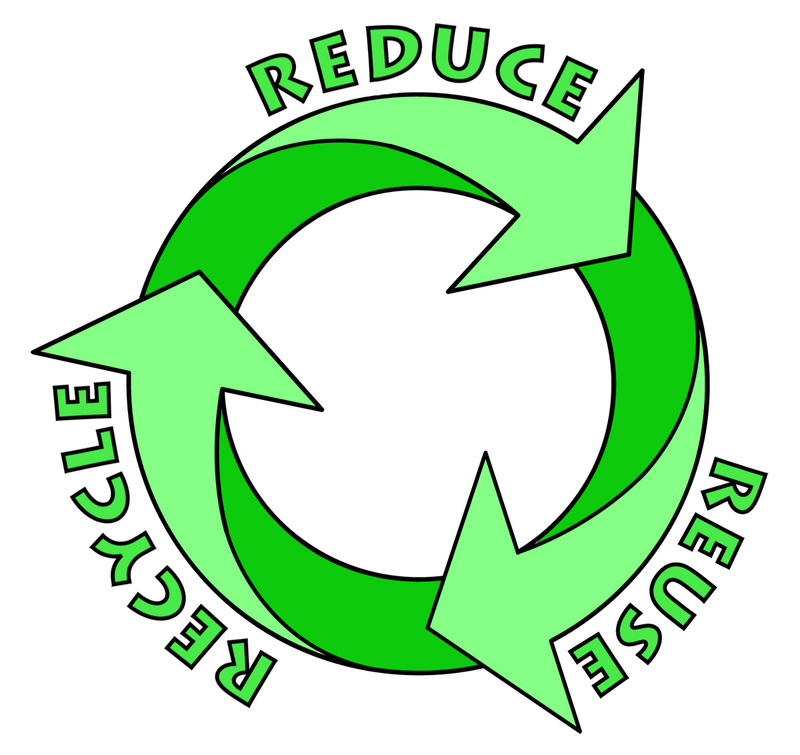 Home Depot has an annual recycling program in early November each year at which they give away $3 to $5 coupons per string. This brings the payback time for replacement strings down to the same 8-year level as for new strings. Next year the price for LEDs is likely to continue to drop, further reducing the payback time. If a 100-light string drops to $9, the price difference will be $6, and the payback time will be 5.3 years. So plan ahead and keep an eye on the prices each year. On the other hand, future energy prices are likely to rise, which also shortens the payback. By the end of the 24 year case study above, I expect energy prices to more than double. If they rise 6% a year, they'll quadruple! Based on 6% increases, a 24-year payback decreases to 14 years before accounting for inflation. If overall inflation runs at 3%, the term extends back out to 17 years. 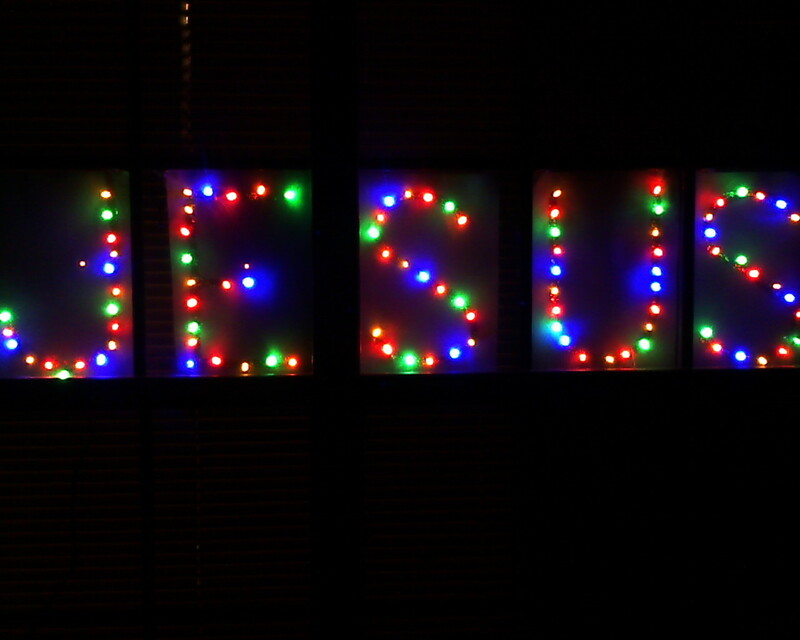 But that case study was skewed--because it doubled the number of lights. If you are going to buy new strings, definitely go for LEDs. Payback isn't immediate, but it's measurable. Know it's the right thing to do, and it will pay you back too. If you are thinking of upgrading strings of lights, next year just might be the year! Plan ahead. Take advantage of coupons and discounts. Just to have some ballpark numbers I can remember, let me summarize some rules of thumb. So 20 incandescent strings show up measurably on your January bill by $20+, while 20 LED strings is imperceptible. Look for the Energy Star label. Energy Star compliant strings have been independently tested not only for energy use, but also for weatherization (if rated for outdoor use), longevity, protection against overvoltage, and they include a 3-year warranty. Look for "always on" technology--so the string stays lit even if one bulb is broken, burns out, or is removed. If a string doesn't advertise this feature, assume it doesn't have it. Stores do not stock many colors, but more colors are available online. Online suppliers also stock white wire and brown wire options along with green. Watch the whites: do you want blue-white, pure-white, or warm-white? Even among the same designation from the same maker, there may be variations, so be aware as you look. Finally, don't just throw old strings into the dump. Even if you don't need the coupon, take your strings to Home Depot next year. 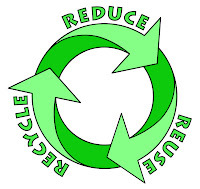 Or search for other local or mail-in recycling alternatives. Here are some web alternatives I found that also claim to give discounts: Christmas Light Source, Environmental LED, HolidayLEDs. and the glory of the LORD shines over you. Fall is in the air, which--as my mother taught me--means it's sweater weather. Last week, President Lee Myung-bak of South Korea recommended wearing thermal underwear as an energy conservation measure in his country. Hearkens back to one of my earliest presidential memories--Jimmy Carter advocating energy conservation by putting on a sweater and turning down the thermostat. Will Lee's long johns be a laughingstock in his country, just as Carter's sweater remains an object of ridicule for many people here? Only time can tell. Yet I remain baffled by the fact that most conservative politicians are not more 'conservative' when it comes to energy consumption. I'm disgusted when the likes of Ann Coulter and Rush Limbaugh ridicule energy conservation measures and pump the use of gas-guzzlers. Sure I understand they are out to 'defend individual liberty' and 'property rights' and to fight 'tree worship', and I know they often speak tongue-in-cheek with lots of irony and satire. But while they may not literally mean everything they say, they certainly don't do enough to promote the enhancement of national security through energy independence. Sure they promote "drill here, drill now," but the most immediate way that American citizens can contribute to national energy independence is reduce! Conserve! And we can have an immediate impact on our own personal finances and thus the national economy as well. The less money we send overseas for oil (to people who don't like us), the more we have to invest in our economy at home. And whenever we waste energy resources, we are not merely wasting our own pocket money right now: that which we waste we borrow from our children. We are creating an energy deficit for our heirs that is every bit as much of an albatross as the national debt we are hanging around their necks. For while the proven oil reserves keep growing, the actual oil reserves--what God has put in the ground for our collective use here on our planet--keep dwindling. They are finite, and there will come a time when they are truly scarce. I can think of a couple of reasons Carter was mocked for wearing a sweater: on the one hand, it seemed unpresidential for him to stoop to talking details of sweaters and thermostats. It seems a bit like the president telling us to eat oatmeal for breakfast. Then too, it's just not concrete and easy to pin down just how much of a difference a little thermostat change really makes. In any event, Carter didn't adequately connect the dots between national security or other national interests and such small details as a change in thermostat setting. Yes we were going through hard economic times, but thermostat settings seem personal, like none-of-big-government's-business. It never became a patriotic cause--like victory gardens in WW2. And maybe there's another reason--perhaps he asked too much 'sacrifice'--along with too small a justification. He called for setting daytime temps at 65° with a setback to 55° at night. Most people have a hard time with that, even with a boat load of sweaters and long johns. More recent suggestions have been along the lines of 68° for daytime (DOE) or 70° (EnergyStar). Last year, I was bent on setting our house thermostat at 68° (and I thought that was high) and my family wanted it at 72° (or above). Eventually we negotiated 69° as a compromise. And I agreed to let the kids use space heaters in their rooms. I tell my kids (with a wink) that God gave us sweaters for a purpose and they are learning to dress appropriately for the season. I was proud of them at that point. Progress is a matter of degrees! It was something they grew into. Our bodies adjust, and often it's a matter of comparison. I've seen night guards in Nairobi shivering in 55° air wrapped in several layers of coats, while I was reveling in the beauty of a July night that was below 80°! They shiver because it's one of the coldest temperatures they ever have to deal with. So how much difference can a few degrees make? Estimates come in wide ranges because because it depends greatly on the house, the weather, etc. DOE claims a 1° reduction for 8 hours a day can save 1% of heating costs (see their page for further discussion); equivalently, a 1° reduction 24 hours a day might save around 3%, speaking in ballpark terms. While there's an overall downward trend, it's a bit jumbled to read because of wide fluctuations in weather especially during January and February. Also, 2009 was a better year than 2010, adding to the spaghetti tangle. In all, however, the following table summarizes the gas usage for winter months versus summer months for 2011 versus prior years, with a resulting 20% reduction in heating consumption. However, when adjusted for the added electric consumption of the space heaters, the actual energy reduction was just 10%. Still, that's progress. * The winter months are December through March and are listed by season according to the calendar year in which winter ends. For example, December 2010 is grouped with January through March 2011 to comprise the 2011 winter season. ** Based on thermostat set to 69°, down from low to mid-70's in prior years. 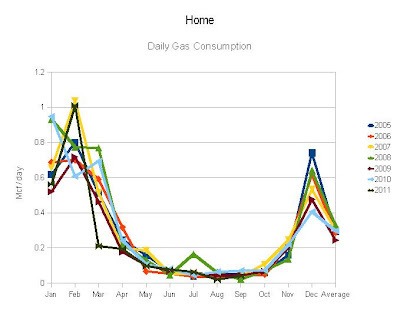 *** The mcf per day has been adjusted upwards to recognize increased electric usage due to space heaters. Adjustment made based on relative energy content using the conversion factor: 1 mcf = 302 kWh. Bottom line: claims of 5% to 30% savings on heating costs based on modest thermostat adjustments are definitely within reach, both by turning the thermostat down all day and/or by using a setback at night or when no one's home. Here's a good article on the setback theory and practice, including a 3-year testimonial of a 28% reduction in heating costs, plus references to studies that consistently show significant savings are possible. What about my office? I share once again a graph of my electric usage over the past 7 years. As can be seen by the dark green line at the bottom, this past January and February I managed to beat or tie both of the prior 2 years, which in turn greatly undercut the previous 4 years. * The winter months are December through February and are listed by season according to the calendar year in which winter ends. For example, December 2010 is grouped with January and February 2011 to comprise the 2011 winter season. ** Based on thermostat set in 50's (as cold as marginally-bearable with heavy clothing). *** Based on thermostat set to 50° during the day and 45° at night, and using a personal 300W space heater. Yes, this past winter I managed to cut my heating load by almost 2/3's! And that in spite of a bitter cold spell in February. Of course, I admit my thermostat settings were insanely cold at 50° daytimes and 45° nights. But that was for the overall building (house). Sitting at my desk was made almost-bearable by a little radiant space heater (300W). In reality the temp in my actual office was well north of 50°, maybe close to 60°. And yes, I wear long johns and sweaters both! So does it matter that someone else has their thermostat cranked up to 80°? That is, does it matter to you and me, to society? 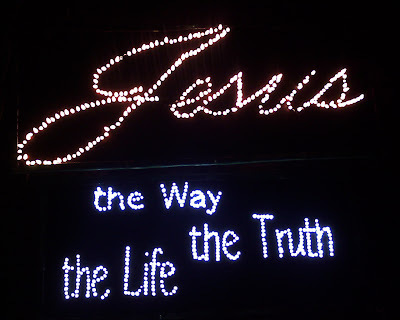 In truth it does. Not just in the big picture, long-term impact. But it hits one's neighbors right now. Remember those rolling blackouts here in Texas last February during that bitter cold snap? And everyone's electric cost is impacted sooner or later by the maxing-out of the power grid. I'm sure there were people last February who thought they had a right to a toasty home or office. Maybe they think they've earned the right as an American citizen. They forget it is supremely a gift from God that they were born in this land of opportunity and can earn a living and provide for their family here. Every blessing from God is given so we in turn can be a blessing to others. Let's see now, am I my brother's keeper? Or let me ask, who is my neighbor?? It is disgusting that some conservatives choose to mock the wise actions of responsible people, and to scoff at voices that advocate reason in the matter of stewarding God's resources. Compact Fluorescent Lights (CFLs) have both friends and foes. I'm a friend, though in the future I see even much promise for LEDs. 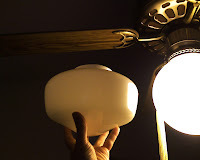 In the journey to replace all our incandescents, I've discovered some useful information--and hit a few jogs and bumps in the road as well. So I thought I'd make a checklist of lessons learned. Be careful. CLFs are glass and can release mercury vapor into the air if broken. Recommendations on cleanup include leaving the area and airing out the room, and very careful disposal of fragments (see more). While I would don my good respirator, I wouldn't go all out with a HAZMAT suit. Buy EnergyStar. Not all CFLs are created equal. EnergyStar has objective criteria on reliability, bulb-life, warm-up time, quality control, and limited mercury content (read more). Don't buy random CFLs just because they're cheap--you might just get what you pay for! * Not an EnergyStar rated bulb. Avoid dimmers. "Dimmable" CFLs are less efficient, dimmer, less dependable, and turn on more slowly. They don't dim that well either--they dim a little, but not down to zero, and they maintain a cold bluish tint. So just replace the old dimmer with a standard on-off switch instead. Avoid CFL flood lights. My experience has been that these turn on slower and burn out faster. The very nature of these encased bulbs involves a small tight enclosure, which tends to decrease performance and lifespan. The best I've found are noted in the chart above, and I have a handful of these deployed. 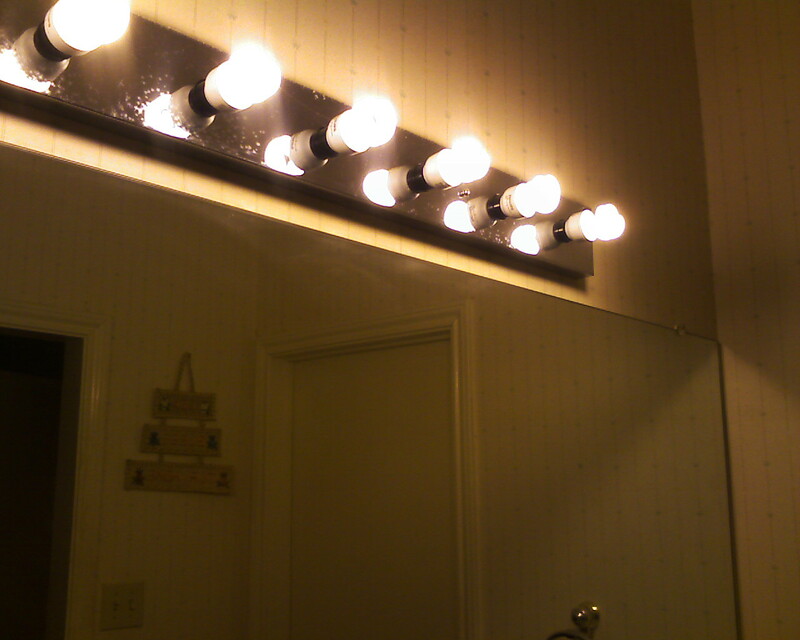 Consider instead using standard CFLs in some fixtures--they may yield as much light as the reflective floods. An even better solution for floods and spots are LEDs as they continue to become more cost-effective: they are perfect for floods and spots since their output is intrinsically directional. Avoid tight enclosures. Overheating dims and shortens the life of CFLs. Avoid photocell controls. Photocells that work with incandescents don't work with CFLs, and those designed for fluorescents may not work very well either. Instead, use a timer designed for fluorescents. This may include replacing a simple on-off switch with a programmable timer-switch for the front porch, which can even allow for a varied programmable setting each day. Avoid colors outside the 2700K to 3000K range. 2700K is close to an incandescent. Above 3000K looks bluish. Be bold and put in swirly CFLs even when they're visible. They have an interesting "architectural" feel. A bathroom vanity light designed for "globe" bulbs looks just fine with swirly bulbs. New and edgy. 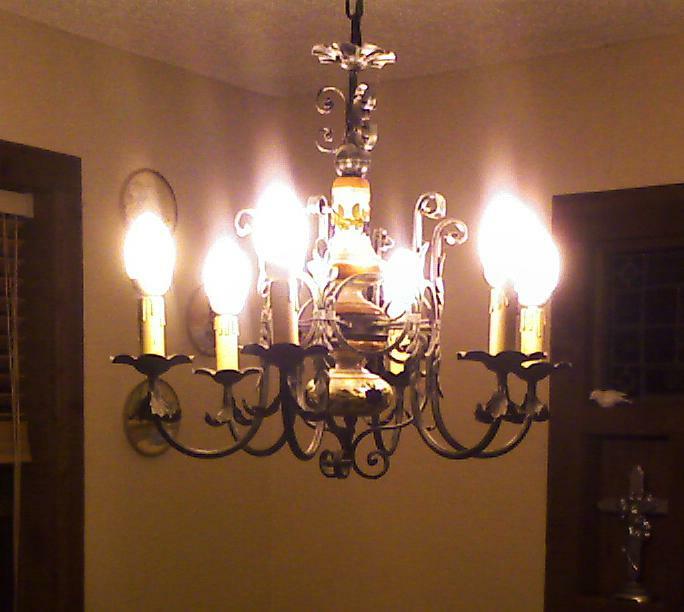 Buy new light fixtures with CFLs in mind. Don't want to see a swirly bulb? 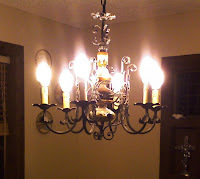 Then choose a fixture where the bulb isn't exposed. Whatever the style, make sure there's adequate clearance for CFLs, both in height and at the base. Do NOT use CFLs in the refrigerator. Because of mercury content and poor cold temperature start-up, the fridge is no place for CFLs. 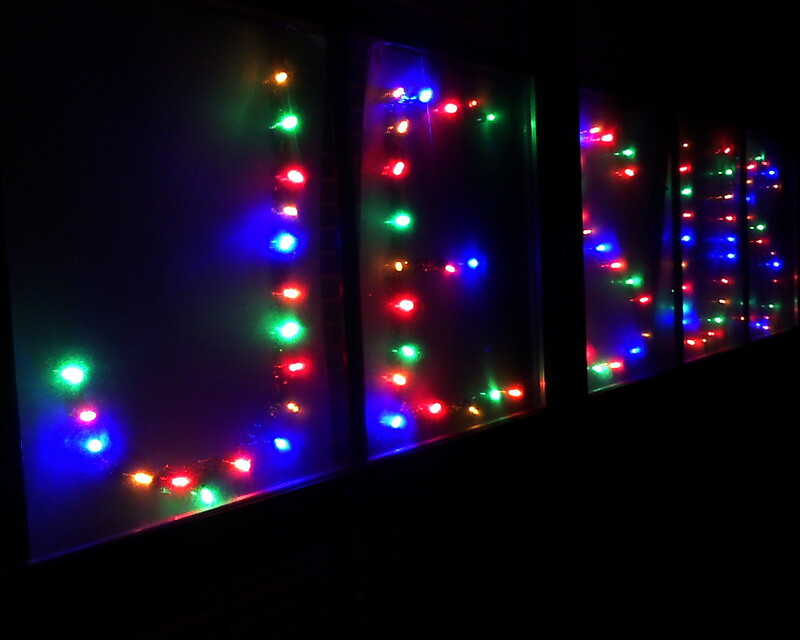 Look to LEDs instead. Go ahead buy a big 12-bulb contractor box--it makes it easy to go through the house and change everything out. They are economical, and you'll keep a good bulb on hand when one burns out. The big boxes also use less total packaging than smaller packages, and the boxes (the ones from home Depot) are 40% recycled and fully recyclable. And those seemingly-incredible claims on the box stating a savings of $1,104 (for 23 watt CFLs) or $660 (for 14 watt CFLs) are in fact credible. 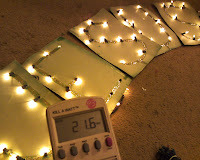 Take the 23 watt bulbs: my rule of thumb says $1/watt saved x 77 watts saved = $77 saved per year x 12 bulbs = $924 total. The manufacturer's math is more detailed and with slightly different assumptions, but my rule of thumb serves to verify their claim--we're in the ballpark together. So even if your incandescents aren't burned out, you're wasting tons of energy and money by waiting until they burn out to change them. What about those seldom used bulbs--like in the attic? Think of it like this: suppose it has half its life left. It was probably rated to last 1/4 of a year (if burned continuously), so it has 1/8 of a year of burn-time left. If you keep it till it burns out, you will have burned up a total of: 100 watts x $1/watt per year x 1/8 year = $12.50 worth of electricity. So stop the bleeding and replace it with a $2 bulb that will save you money every time you turn it on. 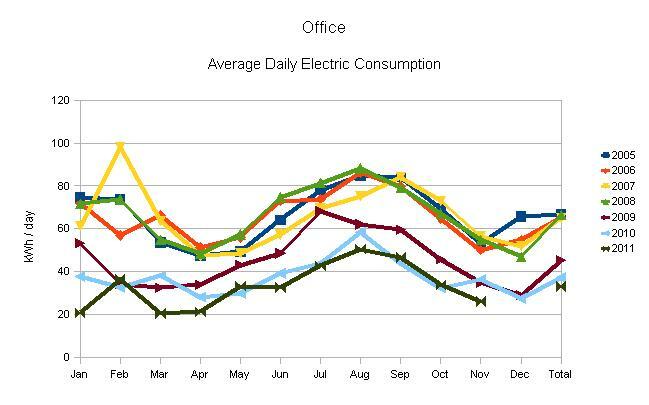 There's another reason to change them all at once: you'll observe a clear, measurable change in your monthly electric usage compared to a year ago. If you change them little by little, the difference will be there, but harder to see. What to do with displaced incandescents? Should you give away those half-burned incandescents? Only to your worst enemy. Sad to say, but just throw them away. (If anyone has a better use for them, let us all know.) If they were wasting your money, why waste someone else's? Why waste energy--for the nation? We need to reduce our national footprint for the sake of our national security and our future generations' energy needs. If you want to give something away, buy two big boxes of CFLs and give one away. Take it to Mission Arlington or your local charity. Or give it to a friend as a not-so-gentle hint. Tell them you're giving them "over $1,000"! Coming soon: a follow-up on Fluorescent Objections! Aesthetically, fireplaces are always nice. They even feel warm when you're up close. But I've always known they're terribly inefficient. After all, most of the heat goes straight up the chimney--around 80%. The real score could be even worse, because the rising hot air has to be replaced by cold air pulled in somewhere through the building envelope, which can make other rooms colder (per MythBusters test - but see discussion). Last year while talking to a friend, he told me of seeing a fireplace insert that could easily heat the whole house. I started investigating and found that modern fireplace inserts are not just a little more efficient than open fireplaces--they can in fact be quite efficient and generate large amounts of heat. In the current climate of energy-consciousness, along with the modern efficiencies of wood stoves and fireplace inserts comes a fancy newfangled term: biomass heating--which simply means the recovery of energy recently captured in biological material. It's what people have been doing for millennia, but now made chic. Biomass stoves can either burn traditional sticks of wood or wood pellets made of compressed sawdust. Pellet stoves can potentially be more efficient because the burn rate can be micromanaged: they have a hopper and conveyor belt that maintains the rate of new fuel added to the fire. The downside of pellet stoves is that the conveyor belt stops when the electricity goes off; also, you can't grow your own fuel. The EPA (Environmental Protection Agency) serves a useful role when it comes to biomass stoves by providing standards and a certification of how clean the stoves burn. As opposed to regulation, this is information that permits you and me as consumers to compare complex and difficult-to-evaluate competing products. 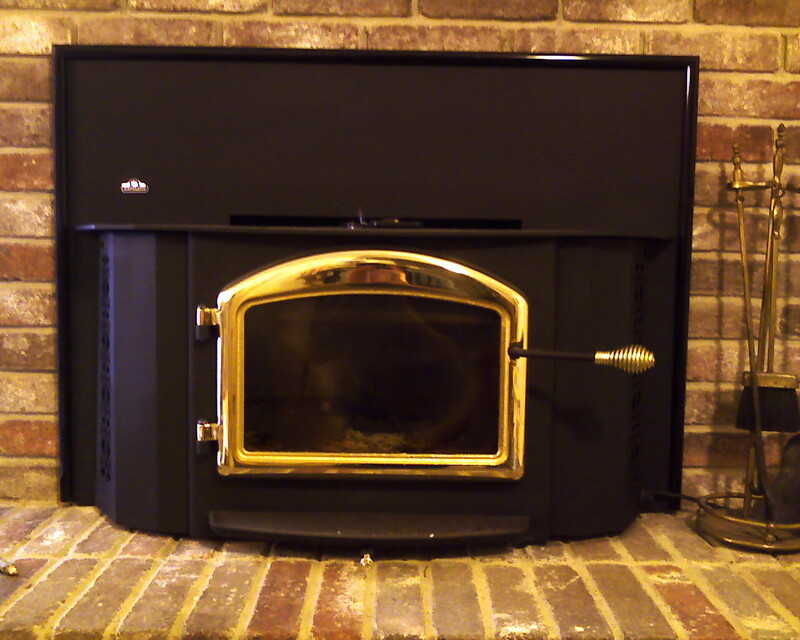 A fireplace insert is really just a wood stove that fits into the fireplace opening, so the list of certified "stoves" includes inserts as well. So last spring we ordered two fireplace inserts--one for our home and one for the office. We went with a mid-range model from Napoleon (1402) that runs around $2,000 installed by Eric Harton (see his website). If you are out at the State Fair of Texas in the next few weeks, drop by his booth at the Embarcadero building booth #27. A nice guy who does good work. "Doesn't biomass energy pollute the air with dirty smoke?" If you see and smell smoke from your neighbor's chimney, you can be sure they don't have an efficient wood-burning insert. Even older wood stoves or inserts produce 15 to 30 grams per hour (gph) of particulate matter. An efficient stove produces a little smoke only in the first 15 minutes while it is warming up--then the visible smoke disappears. EPA certification requires less than 7.5 gph, with most new stoves scoring under 4. Our Napoleon model is rated at 3.5 gph. "Aren't we supposed to be planting trees? Cutting down trees can't be green." Except that it can be done sustainably. Replant trees and they will grow. Grow your own fuel. I planted many trees at my office (our old house) 10 to 15 years ago. Just from trimming them they provide a lot of wood. Look at how many tree trimmings go to the landfill each year. That's wasted biomass fuel. It's better to burn it instead. Some of our own trees need to be cut down soon because of overcrowding or because they're starting to shade our solar array. I plan to replant trees in the back of the yard just for fuel. It's true that an open fireplace radiates at best 25% of it's heat into the room and sends the rest up the chimney. A wood stove reverses the heat loss, giving off as much as 85% or more of it's heat into the house. It does this by slowly burning the wood at a high temperature of around 550°. The oven bricks heat up and slowly cook the wood. In addition, super-heated jets of air provide fresh oxygen to re-burn rising smoke before it actually leaves the oven. (There are also catalytic models that achieve slightly higher efficiencies. But these also add a couple hundred dollars of cost every few years to replace the catalyst, which is fragile and also subject to premature breakage.) In addition, electric blowers in most models circulate air around the stove and disperse the heat into the house. This is one point at which I think the stove makers could improve--why not use an external combustion engine (a Stirling engine) and just use the heat of the stove to power the blowers? "Doesn't burning wood release carbon into the atmosphere?" Tree's capture carbon and the sun's energy, and burning them releases the energy for use and the carbon back to the air to be recaptured by new trees. If dead trees rot instead, the same carbon is released back into the atmosphere. Either way, there is a closed carbon cycle. The issue raised with fossil fuels is the release of carbon back into the air that has been sequestered for millennia--potentially upsetting the current balance of components in the atmosphere. "Can you really heat a modern house with wood?" Look at the BTU/hour rating of a stove. Compare your furnace rating. A small gas furnace may put out 50,000 BTU/hour. Our Napoleon stove is rated at 11,400 to 70,000 BTU/hour--it depends greatly on the type of wood burned and how much you stoke the fire. Hard woods contain more heat content and will burn longer. Of course, a home's architecture affects how much of the home one heating "appliance" will warm. In general, biomass fuel will be considered a secondary and emergency source of heat by most users. But it could be quite a substantial source. Currently I have no hard data to go on for our houses. I can only speculate. What if 50% of our heat this next winter could come from wood? For our home that would amount to $320 saved in our gas bills; for work that would be closer to $200. Subtract out the $100 each I spent to deliver 1/2 a cord (4' tall by 8' long stack) of wood at each location, and the savings is relatively small. The payback could be 10 to 20 years. However, I expect to be much more comfortable at the office because I will relax the extreme austerity measures I've implemented the last few years! And there is the ambiance to enjoy. I'll report back in the spring after we have actual data about savings at home and at the office. The Hearth, Patio and Barbecue Association provides a calculator to give some sense of the relative potential cost savings of adding a new biomass stove. It's interesting and based on some 'typical' situation, but clearly there are more variables than just the cost of the new fuel vs. the cost of the old fuel. 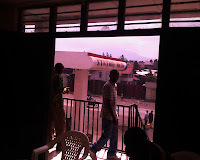 Especially critical is the question of how much the family actually makes use of the new 'appliance' (stove or insert). After all, there's work involved in stoking the fire. But if you enjoy your fireplace anyway, it's a matter of enjoying more fruit from your labor. A good stove will burn the same amount of wood much longer because it burns the wood more slowly and thoroughly. Many stoves have a stated burn-time of 9 hours or so. And what about splitting wood? Does that count as chores or exercise? Maybe both. For a city dweller, buying a new maul (the proper tool for splitting wood) and learning the technique for the first time brings a feeling of accomplishment. Even my younger son found it a challenge to see if he could split wood with one blow. It certainly gets one out-of-doors for a bit and builds a connection with God's creation--kind of like a campfire experience. You can't get that from a cold--or hot--furnace. 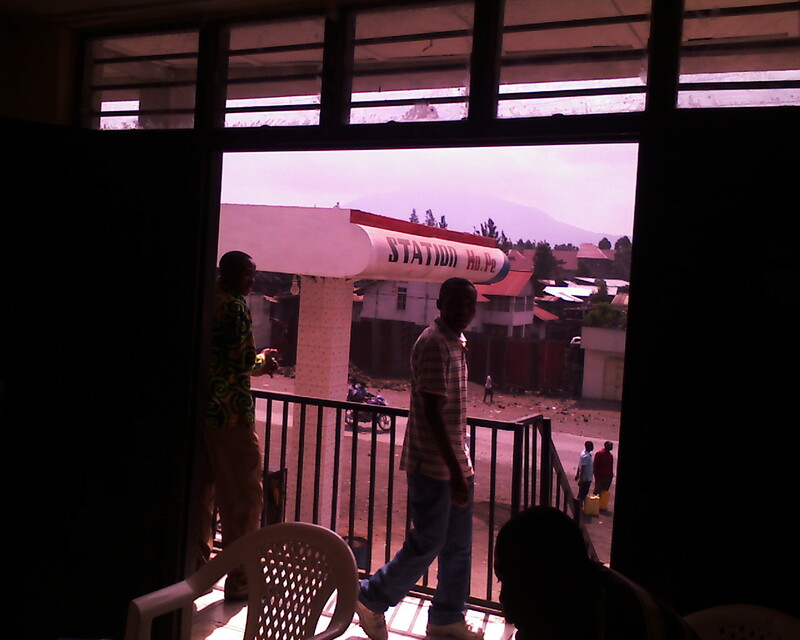 Finally, biomass stoves are a beneficiary of recent green initiatives at the federal level. They are eligible for a 2011 Consumer Energy Efficiency tax credit of $300 if their thermal efficiency rating is at least 75%. While the emissions level of an insert is easy to identify on the listing of EPA-certified stoves, the thermal efficiency rating is harder to nail down. The EPA listing appears to show a set efficiency rating for all stoves by class: 63% for non-catalytic wood stoves, 72% for catalytic, 78% for pellet stoves. Manufacturers, however, often list efficiencies well above 80%. Apparently the tax credit efficiency rating must be certified by and obtained directly from the maker. Our Napoleon inserts are certified at 78.83% efficiency.